The Department of Agriculture Region IV-Calabarzon office has opened its first Malasakit Help Desk at the ground floor of the RMIC Bldg. In Diliman, Quezon City. 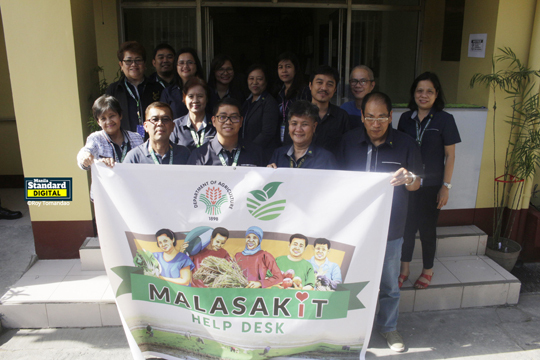 Department of Agriculture-Calabarzon Regional Director Arnel V. de Mesa (second from left, front row) stands with other DA officials in holding up a banner to mark the opening of their Malasakit Help Desk. This was in conjunction with the launching of the Malasakit Help Desk at the DA Central Office led by Agriculture Secretary Emmanuel F. Piñol. Every day, a person will be assigned to the help desk to entertain and answer questions on DA’s services, such as access to agri-fishery information and data, including those involving registration and accreditation, and agri-profiling and validation; access to credit facilities; crop insurance; scholarships; trainings and seminars; and employment. Other Malasakit Help Desks will also be opened in the field offices of the DA Calabarzon soon, Regional Director Arnel V. de Mesa said. The establishment of the Malasakit Help Desk is in line with the DA’s mandate to promote agricultural development and inclusive growth.